Born in Falun, Sweden, this defenceman played six seasons with the Jets in the WHA and NHL. In 1978 Lars-Eric Sjoberg was voted the outstanding defenceman in the WHA and named to the First All- Star Team. He won three Avco Cups with the Jets in 1976, `78 and `79. Nicknamed "The Little General", this natural leader was team captain 5 times. 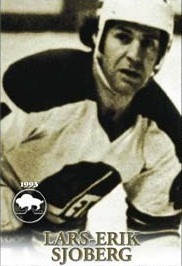 One of the pioneers of the "European invasion" of pro hockey, he played 374 games, scored 32 goals, 197 assists, for 229 points.